With the holiday season behind us and the first day of spring months away, it’s all too easy to settle in on the couch and let free time become screen time. But getting the whole family outdoors is as beneficial in winter as it is in summer. Running, playing, and burning off excess energy on the hiking trail makes for healthy, happy kids. And happy kids make for happy parents. Added benefits like reducing stress, learning about conservation, and bonding with family are icing on the cake. From watershed lakes to historic sites, the Triad region has many great hiking areas that offer fun challenges for kids of all ages. Winter’s the perfect time to track animals in the mud and snow, witness how ice can transform a waterfall, build a snow fort, and even practice cold-weather survival skills. Choose one of these family-friendly Triad hikes for your next family adventure. 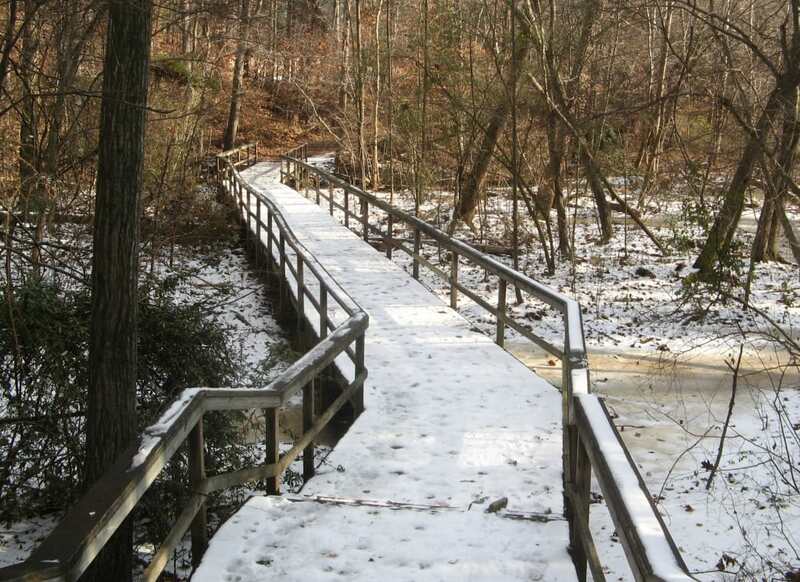 The Piedmont Environmental Center has more than six miles of easy, rolling lakeside trails that are just the right length for families with elementary school-age hikers. You and the kids can tour the nature center exhibits, and then hike the 1.8-mile Bill Favor Lakeshore Loop Trail or one of the shorter loops from the center entrance. Hikers with strollers will want to take the paved Bicentennial Greenway for 2.5 miles through a forest of hardwoods and pines. A heavily wooded valley near Belews Lake, protected from logging for decades, offers a chance to explore a mature hardwood forest on three creekside trails at Knight Brown Nature Preserve. Choose from half-mile to mile-long trail loops, or connect all three for a 2.7-mile trek. Benches and picnic tables give you plenty of scenic rest stops along the way. Break down North Carolina’s 1,175-mile Mountains to Sea Trail into family-friendly day hikes along the shores of the Triad’s watershed lakes. Hike 3.25 miles on Lake Brandt’s eastern shoreline on the Nat Greene Trail, or choose from three hikes along the shores of Lake Townsend. The one-mile Crockett Trail crosses a peninsula with wide-open views across the lake, while the 2.3-mile Osprey Trail is a favorite nesting spot for the trail’s namesake bird of prey. The 2.8-mile Townsend Trail is the longest hike in the watershed trail system and can be combined with the Osprey Trail for a full day of hiking to challenge families with older kids. A day trip to Rendezvous Mountain State Educational State Forest, just over an hour’s drive west of downtown Winston-Salem, gives you a taste of what it’s like to hike in the Blue Ridge Mountains. On the 0.7-mile Talking Tree Trail, young children will love listening to recordings that share details about various trees, while families with tweens and teens can tackle bigger climbs and descents on the four-mile Amadahy Waterfalls Trail. Whitewater kayakers discovered the Class II-III rapids of the Mayo long ago. Now, hikers can explore the Mayo River corridor on two easy trails measuring 1.8 and 0.5 miles. Look for native plants and animal shelters along the 0.5-mile TRACK Trail and earn TRACKer Gear prizes for your finds. The flat and easy trails at Haw River State Park are a window into the swamp and wetland ecosystem at the head of the Haw River. A half-mile boardwalk leads down to the river, the most likely place to spy box turtles, river otters, great blue herons, beavers, and belted kingfishers. Along the 1.5-mile Lake Loop, look for dark red veins running through the rocks, evidence of iron ore deposits that are commonly found in the park. Look for white-tailed deer, chipmunks, otters, and wild turkeys on Eno River State Park’s 28 miles of riverside trails. The Dunnagan and Fanny’s Ford trails are easy strolls along the rocky, shallow river for beginning hikers and families with young children. Bobbit Hole, Quarry Trail, and Laurel Bluffs offer more distance and challenge for experienced hikers and families with teenagers. The trek around the Shaffner Park Parcourse is more of a total body workout than a hike. Get the whole family moving at 20 exercise stations along the one-mile loop. Complete the circuit, and then wrap up your workout at the nautical-themed playground and the paved, 0.8-mile Silas Creek Greenway. You don’t have to travel far from home to find open space for your winter adventure. Four historic sites in the Triad are ideal for combining a hike and history lesson. Tour the grounds of the pre-Revolutionary War Moravian settlement at Bethabara Park on three easy trails that lead through woods and wetlands and pass the reconstructed colonial village. Take an urban hiking tour of the historic buildings and gardens at Old Salem, a living history museum that recreates 18th-century Moravian life on the frontier. Take a walking tour of Reynolda Village, the country estate of tobacco magnate R.J. Reynolds. Trails loop through the gardens and grounds, and connector paths will take you to the cross-country trails of Wake Forest University for up to eight additional miles of hiking. Tanglewood Park is another site that began as a Moravian settlement and was also the country estate of a tobacco entrepreneur. Walk the manicured paths of the arboretum and gardens, or hike the 2.4-mile Yadkin River Nature Trail. A paved loop trail is your best option if you’re hiking with a stroller. Written by Matt Guenther for Matcha in partnership with OrthoCarolina.